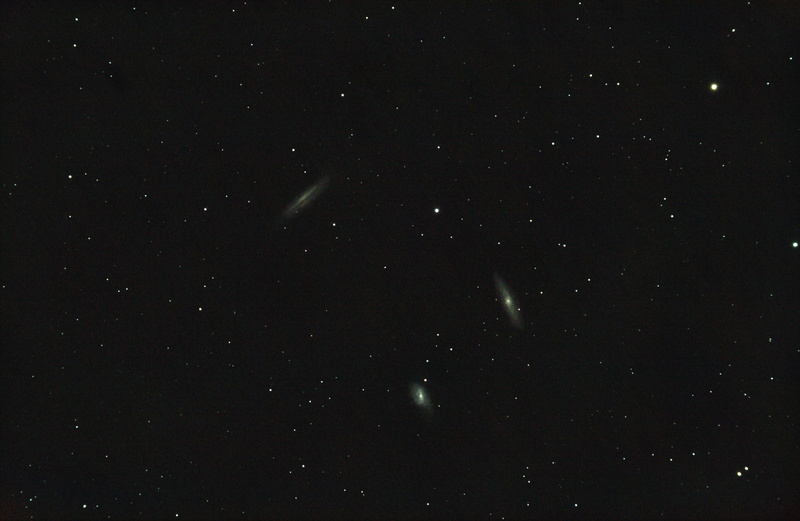 Small telescopes aren’t ideal for galaxies, unless you aim to snap a picture of the Leo Triplet. The area around Leo has many galaxies, but the three below (M65, M66 and NGC3628) are brightest and most recognized. All three galaxies are of the spiral type, but look different because of their orientation. NGC3628 is edge-on and the dark band in the middle are dust lanes that cut across it. This trio is located 35 million light years away. This entry was posted in Photo and tagged Astrophoto, Astrophotography, Galaxy, Messier by Benoit Guertin. Bookmark the permalink.